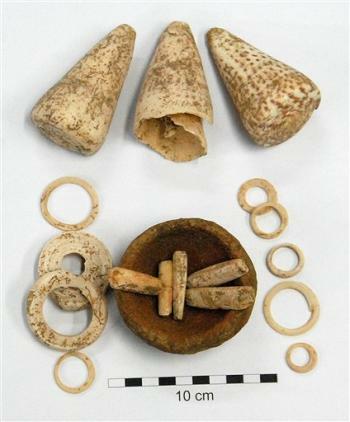 Excavators on Viti Levu, Fiji’s main island, found a cache of jewelry and high-quality pottery made by the Lapita people, the earliest settlers of Fiji. The artifacts are about 3,000 year old. The site was likely a manufacturing center for shell jewelry and the cache a “deliberate burial of a shell jewelry collection” by the Lapita inhabitants, Nunn said. Not only is the ancient jump in artistic skill remarkable, but after the Lapita disappeared as a distinct group around 550 B.C., Fijians stopped producing that high quality of shell jewelry and pottery altogether. Anthropology professor Peter Shepphard thinks the decorations were the Lapita’s attempt to stay connected to their roots in the Bismarck Archipelago. Perhaps once their identity as a people faded, so did their muse. This entry was posted on Friday, April 25th, 2008 at 6:52 AM	and is filed under Ancient, Treasures. You can follow any responses to this entry through the RSS 2.0 feed. You can skip to the end and leave a response. Pinging is currently not allowed. I find Lapita pottery fragments on Northeastern and Western beaches on the island of Saipan in the Northern Marianas Islands. The local museum has an excellent pottery example, excavated just prior to WWII. Local tradition has it that these people were of a Canoe Culture that arrived from the West, and that their pottery was used to store rice grains. Local and international research supports this, and some researchers place Saipan as one of the first stops these people made during their migration Westward. Intriguing. Have the pottery fragments been dated? or Madgazcar? Say 5000Bc or ealier?